With great sadness I report the death of the Australian conductor Patrick Thomas, who was born in Brisbane in 1932. Although he was not particularly well-known in Britain, he did visit here from time to time, including conducting BBC orchestras and the Hallé. However, his career in Australia was both extensive and of great significance to Australian music. He studied flute, piano, organ and singing, and was a flautist with the Queensland Symphony Orchestra, also doubling up as an organist and choirmaster in Brisbane. His career as a conductor lasted for more than 40 years. He conducted the Queensland Symphony Orchestra from 1973-77, and then became the Australian Broadcasting Corporation’s Conductor-in-Residence from 1978-86, working with, among others, the Melbourne Symphony Orchestra and Sydney Symphony Orchestra. He also conducted ballet and opera. He premiered many new works and assiduously promoted Australian music. 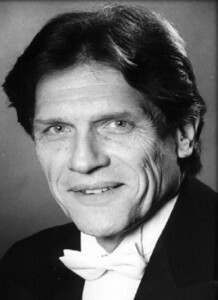 Among many honours, Patrick was awarded the MBE in 1978, and Honorary Life Membership of the Fellowship of Australian Composers in 1998 (a first for an Australian conductor). In 2014 he became a Member of the Order of Australia. When his career as a conductor drew to a halt he became a writer and broadcaster, including writing an excellent autobiography. He also wrote books of humorous light verse, and wrote and voiced many scripts for his programme ‘Patrick Thomas Presents’, on radio station, Fine Music 102.5 in Sydney, Australia, for whom he arranged several programmes of John’s music, including one still to be broadcast. After John’s death, Patrick and his wife Helen, were the kindest of friends to me, even if at long distance, continuing my own warm relationship with Australia. This brief resumé of Patrick’s life is written as a testament to the warmth of friendship over many years, and to John’s respect for Patrick’s knowledge, musicianship, wisdom, humour and kindness.